Looking for the perfect recipe can be exhausting because there are just so many out there. I’ve tried countless cupcakes over the years, but this is my top favorite recipe. I know we all have different preferences when it comes to our taste buds, but I honestly don’t think you can go wrong with this. The cake itself is moist and tender, not too dense nor too light, with just the perfect crumb texture. This is the only cupcake batter I’ve used for years now. Sometimes I replace the ½ cup of milk in the recipe with an additional ½ cup hot water. I love both versions equally, so you can make the two of them and see which one you prefer. This recipe yields 16 cupcakes for me, but it might not be the same for you since each muffin tin brand is a bit different in its size capacity. Just fill the tins ¾ full with batter. I’m talking deep, intense, chocolaty, fudge-consistency frosting. 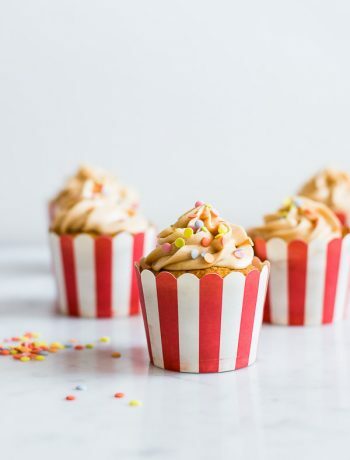 One that you’ll steal bites of from the bowl so many times that you’ll end up having nothing to frost your cupcakes with. The intense flavor comes from a combination of dark chocolate and cocoa powder. If you don’t want it too intense, add just a bit of cocoa powder at a time until you reach the desired taste. Then there’s some heavy cream and the other usual goodness such as butter and powdered sugar. If you happen to have corn syrup, you can substitute some of the powdered sugar with it. This will make for an extra smooth frosting. Both natural unsweetened and Dutch-processed cocoa powder are ok, and either milk, semisweet, or bittersweet chocolate can be used. It’s very important to sift the powdered sugar and cocoa powder, or else the frosting will be grainy. Also, make sure to beat the butter, sugar, and cocoa for at least 3-4 minutes, until completely smooth. If the frosting is still somewhat grainy, switch to the whisk attachment. 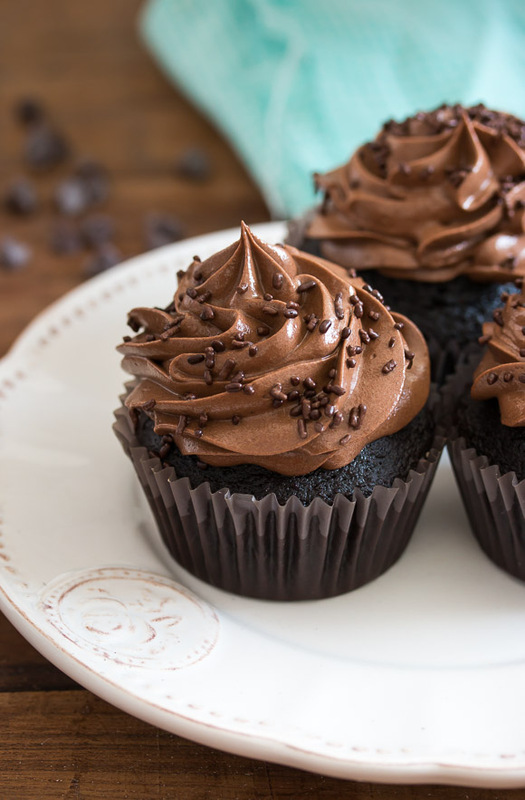 If you’re aiming for death by chocolate cupcakes, then would you like to be my best friend? Please think about it. 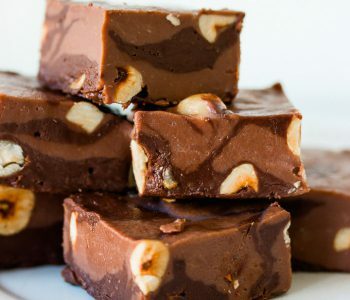 I suggest adding chocolate ganache (half of the recipe is enough) as a filling, or adding 1/2 cup chocolate chunks or chips to the batter itself. But do prepare to meet death—in a totally good way. Mam pls make video how you make frosting ….. 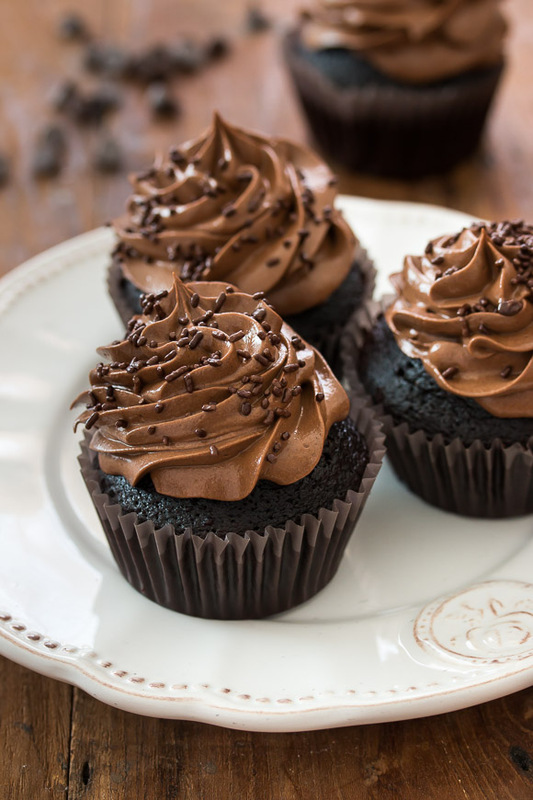 These cupcakes definitely do look like the ultimate chocolate cupcake.. they look so dark, moist and delicious. Perfect amount of frosting ratio too! I kind of want to stuff my face with 10 of these cupcakes 🙂 They look absolutely delicious and that frosting looks so amazingly creamy! Weight/Gram measurements are more accurate, so if you have a kitchen scale, use it. Otherwise, use measure by volume/cups. How many cupcakes does this make? And they look amazing! Hi Anna, this recipe yields 16 cupcakes, and you can find this information under the recipe title. Hi Rachel, since this recipe includes butter both in the cupcakes and the frosting, there’s no substitution that would yield similar results. Try to look for a different recipe that’s dairy-free. The cupcakes look amazing. One question, I see that it doesn’t call for baking powder. Is that correct? Thank you, Marta 🙂 Yes, the recipe calls for baking soda only. These look amazing, one quick question.. Can the APF be substituted with cake flour? Hi Stella 🙂 I wouldn’t recommend doing it because the cupcakes would be too delicate. I suggest to stick to the recipe in this case. OMG these look amazing going to try them out soon thanks for sharing Shiran. These blew my mind. Thank you! Yum. Making the cupcakes tonight for my daughters 3rd birthday tomorrow. Can I make the frosting tonight and store it overnight so I can frost the cupcakes right before the guests come over. What is the best way to store frosting? Made these today and they are absolutely Amazing!!!! The best chocolate cake ever and the frosting was great. I used the corn syrup with powdered sugar suggestion and couldn’t be happier! I’m trying out desserts for my daughter’s upcoming birthday party. Any recipes for white or another flavor?! Hi Jessica! I’m so glad you like the cupcakes 🙂 There are so many good recipes so it’s hard to choose one! Are you looking for cupcake or cake recipes? You can find all the recipes in the recipe index, but if you want me to recommend something specifically, let me know 🙂 All the cupcakes are amazing (vanilla, peanut butter, lemon) if that’s what you’re looking for. Happy birthday to your daughter! What kind of dark chocolate should be used in the frosting? Would melted chocolate chips work? Thanks for sharing your recipe! Hi Heather 🙂 I usually use chocolate bars and not chocolate chips because the two can be a little different depending on the brand (in short – the reason for this is that chocolate chips need to keep their shape when heated, which is good for chocolate chip cookies for example). Usually the best thing to do is to taste the chocolate – if you like it, you can use it in the recipe. It’s just a matter of taste. I just recently made these and they came out really good. I didn’t have actual chocolate for the frosting, so I made a chocolate paste with cocoa powder and vegetable oil instead and it still came out good. I made these for my husband’s birthday this weekend and they were a huge hit! I did make two changes that you might want to try sometime – first, I replaced both the milk and hot water in the cupcake batter with 1 cup of hot brewed coffee (I love coffee in chocolate cake batter). Then, out of necessity because I inexplicably didn’t have any dark chocolate, I used 2 oz. of melted unsweetened baking chocolate in the frosting. The result was delicious, but I’m sure it would have been just as good if I’d been able to follow the recipe as written! Also, as others have said, your recipe makes the perfect amount of frosting for the cupcakes. Thanks for a great dessert! I made the cupcakes last night. I added a teaspoon of cinnamon. I’m looking for a decadent cupcake for a 3rd birthday party. I think we found a winner! These look great! You said you sometimes swap between using only water or milk. What are the differences to the taste and texture between the two? Just curious and wanting to give it a try! Thank you, Liz! It’s a matter of personal preference so I suggest to try and see because both versions are delicious. 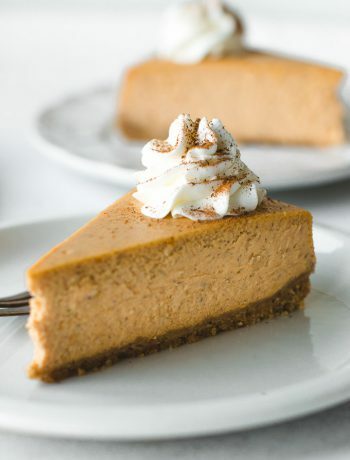 Milk adds flavor and the extra fat makes the cake more moist, but with the water it would be lighter. Also, in some chocolate cake recipes hot water is mixed with cocoa powder usually because it enhances the chocolate flavor (and you can try it in this recipe, too). Quick question; this recipe calls for natural cocoa but your cupcakes are so dark! How are they so dark? Hi Naseerah! These cupcakes turn out quite dark even when using natural cocoa powder. If you want them to be very dark, you can substitute the natural cocoa with dutch-process, and the baking soda with 2 teaspoons of baking powder. Just made these. I followed the recipe to a T. My batter was not as liquid as boxed cake mix is. It was more creamy. The cupcakes turned out kind of dry. Hi Danielle! Cakes made from scratch are usually different than a cake mix, especially in texture. The cupcakes shouldn’t be dry at all. 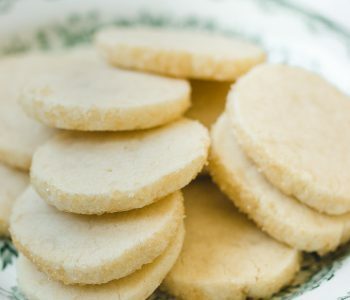 There are 2 reasons why they might have turned dry – either over-baking them, or over-mixing the batter (mix as little as possible once the flour is added). Made these a couple of weeks ago and everyone loved them! I want to make them again but I’m having a hard time finding heavy cream. What can I use as a substitude? Hi Sharon 🙂 You can use milk instead (maybe a bit less because its consistency is thinner than heavy cream). You can also just omit it if you want. Is there any way to substitute the dark chocolate. Or is dark chocolate the route to go? Hi Madison, it’s possible to make the frosting using only cocoa powder without dark chocolate, but in that case, you won’t only need to increase the amount of cocoa powder, but probably also the powdered sugar and heavy cream. Using dark chocolate (bittersweet or semisweet) yield the best result. Id love to make these cakes but I am in Australia and we have pain flour self raising cornflour etc. Can you tell me how to make “all purpose four? I notice many recipes have this. Hi Veronica! Whenever you see all-purpose flour, just use plain white flour (and not self-rising flour that contains baking powder). I just made this and it was so gooood! These turned out absolutely GORGEOUS! They are so delicious, moist and perfectly chocolatey but not too overpowering. I will definitely recommend this recipe to all my family and friends. Just amazing. Thank you for such wonderful cupcakes~! Hi. These cupcakes look yummy. I love chocolate and wud definitely try this. I just have one query, my family is pure veg. Is there any way I can substitute or remove eggs ? Wud be glad to know the answer. I have no experience with replacing eggs with a different product in my recipes, but you can read a lot of information about it online. At what temperature donee need to bake them? 180 only? You should bake it at 350 Fahrenheit or 180 Celsius. This is a good recipe. The first time I made it, I thought it was lacking chocolate flavor, but the cupcakes were very moist. On my second attempt I only had about 130 grams of flour and made up the difference with cocoa powder. I decided to use a full cup of water and added maybe a tablespoon of espresso powder, I used half white/half brown sugar, also added a bit more vanilla. These adjustments were perfect! The cake is still moist, but the chocolate flavor is much more intense! Also, the second time I baked in a 9×13, same temp for about 23 minutes. 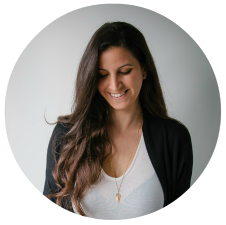 Your adjustments sound delicious! I like brown sugar in recipes and often add a bit of espresso powder to enhance the chocolate flavor. Thank you for your comment! Thank you so much for this recipe! It’s fantastic. I was going to try a few different chocolate cake recipes, but after the first batch of cupcakes came out of the oven and I tried them, I turned right around and made these for the second batch as well! I substituted coffee for the hot water. Brilliant recipe, thanks again! For the cake batter, is one type of cocoa powder preferred over the other? Do you suggest natural is better for the batter? Hi Crystal! I actually prefer Dutch-processed cocoa powder. It gives a deep chocolate flavor to the brownies. can I make these mini ? These were great! I even messed up and accidentally put in a whole cup of milk so had to double the recipe at the end. I slowly mixed all of the extra ingredients and made a small cake with the extra batter. Even with messing up the order, the cupcakes turned out well! They’re a bit moist and really tasty! best chocolate cupcakes I’ve ever made even on day 4 they were just as moist and yummy as the first day!!!!! definitely keeping this recipe!! That’s so great to hear! Thank you so much, Amanda! Hi shiran! Can i make use of this recipe to make a cake? I love this cupcake so much that i wanted to use it in making a cake. Hi Rona, you can always try and see if you like the result. Personally, I like this recipe for chocolate cake which is much more moist and fluffy. It’s a perfect cake! Thank u shiran! May i know what frostingdoesnt melt easily? Oh my goodness these cupcakes are AMAZING !! I’ve made them about three time now and every time people don’t believe me I made them from scratch they taste that good ! The best choc cupcake reciepe out there THANKYOU ! Thank you so much Monica! Happy birthday! I made these cupcakes for a family party, and they could not get over how delicious they were! They were so moist, and not too sweet. Thank you for the recipe! I’m so glad to hear that! Thank you so much Marcy! 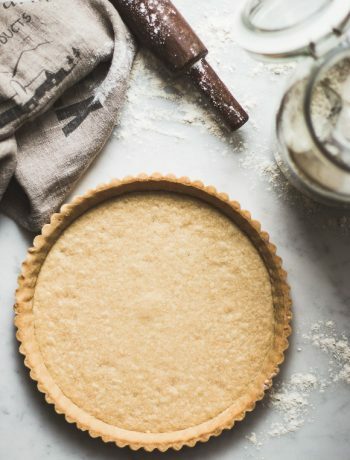 Is it possible to substitute the baking soda with baking powder instead? As I hv only the latter with me. Hi Shikin, if you use Dutch-processed cocoa powder, you can use 2 teaspoons baking powder instead of the baking soda. I’m so glad! Thank you so much Chantal! Hi Rina, I suggest to start with less than half and see if you like the result. So for example if you need to use 1 cup of sugar, use 1/2 cup sugar and 1/4 cup corn syrup, then add more sugar/corn syrup depend on how you like the flavor and consistency. Wow! Totally AWESOME cupcake recipe! So moist! I made an awesome mint frosting recipe and then drizzled on melted chocolate and stuck a PIECE of chocolate on top. Looked and tasted AWESOME! My brother said they were the best cupcakes he ever had! Oh, and I also followed your suggestion with the corn syrup in the mint frosting recipe and it turned out GREAT! I have totally fallen in love with this recipe and will forever be my chocolate muffin mix for years to come! Thank you so much for sharing it with us all. I honestly can’t wait to try your other recipe’s! 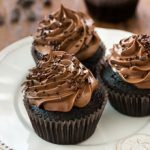 My new go to recipe for chocolate cupcakes! I used cake flour, as that is what I had on hand, and they still came out delicious. Didn’t try the frosting this time because my kids wanted regular buttercream frosting but next time I make them I am going to try the chocolate frosting, and maybe some shaved chocolate on top. Thanks so much for sharing this wonderful recipe! Just an FYI, if anyone was wondering. I made these just now, and I got 60 mini cupcakes out of one recipe. Followed the recipe exactly with no substitutions. They cooked in 10 minutes at 350. Haven’t made the icing or tried them yet, so I can’t say how they turned out, but I thought people might be interested in a mini cupcake yield. How big is each cupcake? I mean the dimension. I’ve never measured them, but I just use a standard size/regular cupcake pan. Thank you so much for the recipe, it’s sounds lovely and I can’t wait to try it! Just curious, why does the water have to be hot? What does that do for the cake? Also, does the milk have to be whole milk? And would a full fat sour cream or yogurt be ok to use instead? Yes, it needs to be whole milk. I love using sour cream or yogurt in chocolate cakes, but when replaced with milk, it usually requires adjusting the quantities of other ingredients, such as using baking soda. Hi Mimi, the hot water yields super chocolate-y and moist cupcakes! Could this recipe being used to bake a whole cake instead of cupcake? Personally I like my chocolate cakes very moist and fudgy, more than cupcakes. I like the chocolate cake batter in this recipe, or this one. I used your frosting recipe to top vanilla cupcakes. Weight measurements and the soft/moist look drew me in. I didn’t want a sugary one that would get dry and crusty by the next day. The sweetness wasn’t overpowering, it didn’t get crusty and it had great chocolate flavor. However, it was too thick to pipe or perhaps it needed to be gently warmed? I had to thin with about 3-4 tbsps of milk. Hi Nivedita, it’s ok, if it’s too thick you can always add cream or milk to make it thinner, or if it’s too thin, you can always add more powdered sugar. It shouldn’t be warm. Hi Mimi, for milk I prefer 3%, but all options are good. if I want to add baking powder instead of b.soda will it ruin the cupcake or not?how much baking powder I can substitute with? If you’re using dutch-process cocoa powder, you can replace the baking soda with 2 teaspoons of baking powder. I’m planing to make birthday cake for my sister in the next month and I have sth big in my mind.A giant cupcake with fondant; honestley I have never tried fondant. since I will be too tired working with fondant I don’t want to take up my time by making and remaking buttercream. can you please tell me this yummy buttercream will help me with covering the cake and the layers? Hi Basira, you can use the chocolate frosting from this recipe, it should work fine with the fondant, but depending on the size of your cake, you might need to make a bigger amount of the frosting. Can you explain what exactly went wrong? Was it the texture/flavor? 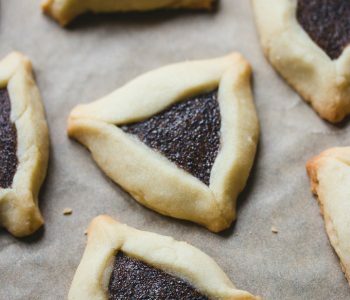 Hi, I’m sort of a beginner and was intrigued by this recipe. I’m really hoping to try it based on how satisfied these reviews sound, but I don’t happen have any kind of mixer. Could I just mix using my non-existent strength and hand utensils? Hi Rachel, I say try it anyway (and google it to see the options). The cake might be less fluffy and light, but you’ll get good result. Use a whisk to make the frosting if you have one. Made the cupcake recipe tonight. I was skeptical because the batter was REALLY thick (I almost added more hot water), however they turned out to be the perfect consistency. Muffins look and sound amazing! Do you think I could put coffee in the hot water? can i make the recipe in half? I have a party in two weeks can i make these and freeze them? I have a lot to make and wanted to get a head start, also will the frosting hold up in hot weather? It depends on how hot is the weather, but it should be ok as long as it’s not sitting under direct sun. It’s not possible to freeze cupcakes once they’re frosted, however you can prepare the cupcakes and frosting a few days before. Unfrosted cupcakes can be kept in the freezer for up to 2 months. Thaw, still covered, on the counter or overnight in the fridge. The frosting can be kept in the fridge, covered, for up to 3 days. Before using, bring to room temperature and whisk until smooth. Can I use buttermilk instead of normal milk? Just trying to use up the rest of the buttermilk I used for your delicious chocolate cake recipe! Hi Sienna! I’ve tried it once and it worked well so you can use it. So, I’ve just made these delicious cupcakes using my new kenwood multi one machine for the very first time, was so easy and they turned out perfectly. I’ve never made cakes or cupcakes from scratch until today. Was so easy , will never buy packet mix again! Hi Shiran. This recipe yields 16pcs . How should I change the measurement so i can get about 25-30 pcs of cupcakes? The easiest option is to double the recipe and get 32 cupcakes. I made these today. My batter was a lot creamier instead of runny. When I pulled them out of the oven there was liquid looking foam coming out the top of some. I noticed when I was putting them in the pans to bake some of my sugar didn’t mix up the greatest so I’m not sure if that was an issue too. They still tasted great. I’m going to retry the recipe again as the taste was absolutely perfect chocolate flavor! Hi Shiran! 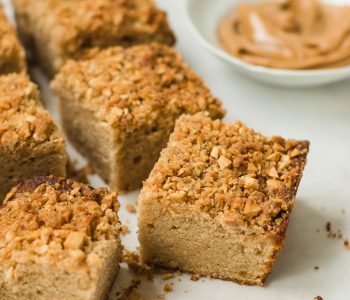 Would you recommend natural or dutch processed cocoa powder for this recipe? I prefer dutch process cocoa powder for a deep chocolate flavor! WOW!!!!! These are great!!!! I just made them and they are delicious!!!! I live in Alaska and these are perfect when my family goes hunting!! My first attempt at making chocolate cupcakes was a huge success, thanks to Shiran’s wonderful, simple recipe! Because this was my first time, I was nervous at the runny consistency once I finished mixing all of the ingredients. However, my fears were allayed as the end product was moist, not too chocolaty cupcakes that my family devoured. I had to bake them for 25 to 30 minutes which was not an issue. Shiran, thanks again for sharing such a great recipe!!! I give this 10 out of 10 stars! Thank you so much Kay! I’m so glad! are you able to use this recipe with normal cake pans rather than cupcakes (if you adjust the cooking time etc) Hubble loves the cupcakes and wants a birthday made ? Hi Lauren, it’s possible to use it for cake, so you can try it and see if you like the result. I like this recipe for chocolate cake or this one because they are much more moist and fluffy, but it’s a matter of personal taste. Instead of using dark chocolate can I use Nutella? I have a recipe for Nutella cupcakes and Nutella frosting here. I made these today and they turned out great! Followed, the recipe exactly and they turned out fab. I might try changing up the frosting next time, using a simple ganache. The base cupcake is exactly what I was looking for. Most recipes call for oil, do you find the butter adds more flavour? If I use Dutch processed with baking powder, will I still get a nice dome with the cupcakes? Lastly, I’ve made buttercreams with melted chocolate and found they seized or became very hard, have you had these problems too when testing recipes? Hi Ann, yes, the butter gives a wonderful flavor and texture to the recipe. Dutch processed cocoa powder is great. They will get a nice dome, it depends on how much you fill the muffin tin. Personally, I like my cupcakes rather flat, so it’s easy to frost them. About the frosting, let the melted chocolate cool and add it very slowly to the mixture while the mixer is still running. Make sure the chocolate and the butter mixture are not too warm or too cold when combining them. These cupcakes were amazingly good! I don’t really like frosting and I usually take it off and just eat the cake part. This frosting is fudgy and delicious! I ate the whole cupcake frosting and all! Hi Seema, dark chocolate cannot be substituted with cocoa powder. I wanted to know can I substitute dark chocolate instead of using cocoa powder. If so how and how much please. I tried these cupcakes. They turned out to be great. Made these today for a freind ans made a couple extra for a friend. Best chocolate cupcakes ever. I used Hershey’s Dark cocoa powder and melted dark chocolate in this receipe. Almost akin to a black velvet recipe. My husband absolutely loved them. Will definitely make this again. Can you replace the sugar with maple syrup? I just made the cupcakes and followed the recipe to the t, but the texture of the sponge shrank from a fluffy one to a dense and hard one within like 10 minutes after i took them out of the oven. And it hasnt gotten any better since they coold down. Im about to cry.. i promise my in laws to make these cupcakes! These look fantastic! Can I replace the whole milk with buttermilk instead? I always suggest sticking to the recipe, but yes, buttermilk would work here. 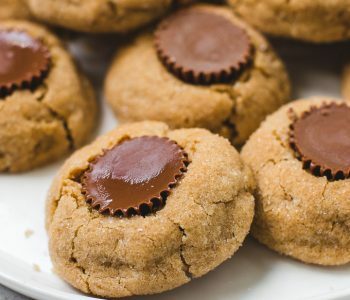 Would you recommend doubling this recipe if needing more cupcakes, or just making 2 separate batches? Can i make this as a standard cake and not cupcakes or is it too dense? I recommend the batter of this cake, or this one. Both are delicious!